WEST BROM TICKETS SEASON 2018/2019. 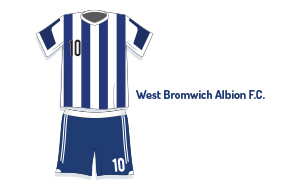 1st4 Football Tickets sells Premier League West Bromwich Albion football tickets for home and away matches. You can either buy your tickets to watch West Bromwich Albion online, or you can call our West Bromwich Albion football ticket hotline. Book West Brom 2018/2019 tickets securely online for all West Bromwich games. 1st4 Football Tickets can provide you with West Bromwich Albion Premiership football tickets to all Premiership matches including West Bromwich Albion top matches such as: West Bromwich Albion - Manchester United tickets, West Bromwich Albion - Arsenal tickets, West Bromwich Albion - Chelsea tickets, West Bromwich Albion - Newcastle United tickets and West Bromwich Albion - Manchester City tickets. We can get you any West Bromwich Albion match ticket that you want. Call our West Brom Ticket Hotline for more West Brom tickets.